PAHOA, Hawaii (AP) — Lava from Hawaii’s Kilauea volcano is pouring into the sea and setting off a chemical reaction that creates giant clouds of acid and fine glass. 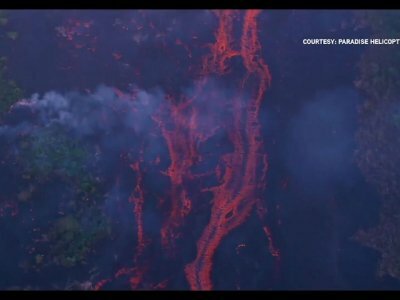 The lava haze, or “laze,” is created when molten rock hits the ocean and marks just the latest hazard from a volcano that has been generating earthquakes and spewing lava, sulfur dioxide and ash since it began erupting in Big Island backyards on May 3. The dangers have forced at least 2,000 people to evacuate and destroyed more than 40 buildings. It’s also created anxiety for thousands of others about the possibility of lava heading their way or cutting off roads they depend on to get to work, school and grocery stores. Laze is formed when lava enters the ocean and triggers a series of chemical reactions. The seawater cools the lava, which forms a glass that shatters. Tiny pieces are picked up by the steam cloud, which contains hydrochloric acid that also is created by the interaction of lava and the ocean. Scientists call the glass Limu O Pele, or Pele’s seaweed, named after the Hawaiian goddess of volcano and fire. The clouds contain hydrochloric acid, which is about as corrosive as diluted battery acid. It can irritate the skin and eyes and cause breathing problems. Babb says protective masks that officials have been distributing to protect people from volcanic ash will filter particles from lava haze but not the hydrochloric acid. Laze itself is not enough to cause serious burns, Babb said, unless someone is right on top of where lava enters the ocean. Waves also can wash over molten lava and send scalding water onshore, so people should maintain a safe distance. No major injuries have been reported from lava haze. The U.S. Geological Survey says laze contributed to two deaths in 2000, when seawater washed across recent and active lava flows. WHO NEEDS TO BE CONCERNED ABOUT IT? Mostly people who are near the lava entry on the southern coast, either on land or in boats just offshore. Where the plume wafts depends heavily on wind direction and speed. The gas clouds initially appear on the shoreline, but trade winds on Sunday carried plumes about 15 miles (24 kilometers) to the southwest. The cloud was offshore, running parallel to the coast. When the winds die down, the plume can flatten out. Its size, meanwhile, depends on the volume of lava falling into the sea. The hazards minimize once the shards fall to the ground because the glass would mix with the Earth. WHAT OTHER THREATS DO PEOPLE NEED TO BE WORRIED ABOUT? Methane explosions could be a problem as lava flows into areas with a lot of vegetation. Babb said that is because decaying vegetation creates pockets of methane, which the lava’s heat can ignite. Late Sunday or early Monday, lava entered and then stalled on the property of a geothermal plant. Officials earlier this month removed 50,000 gallons (190,000 liters) of stored flammable gas from the site to reduce the chance of explosions. Hawaii County spokeswoman Janet Snyder said the lava stalled behind a berm on the property boundary.